For over 20 years, Wales’ smallest town has played host to the one of most unusual events in the watersports calendar – the International Bog Snorkelling Championships. Every August bank holiday, hundreds of hardy spectators and competitors from around the globe gather around the dense peat bogs near Llanwrtyd Wells in Powys, mid Wales, for the celebrated bog snorkelling championships. 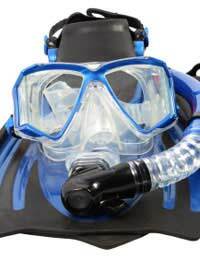 Kitted out in a snorkel, mask and flippers, competitors must complete two successive lengths of a 60-yard bog drain using flipper propulsion alone. This means that instead of graceful swimming strokes there is usually a lot of flailing and splashing involved. Bog snorkelling is not as easy as it may look. Although open to all, only the physically fit and most dogged make it to the end. The muddy water is often described as being like ‘pea soup’ and requires a lot of flipper power to move through. Also the summertime setting doesn’t ease the temperature of the water at all, and the bitter cold tries its best to seize up the snorkeller’s limbs. Maintaining direction also proves to be a big problem for many snorkellers. The waters are so black and murky that competitors must thrash forward blindly, raising their heads every now and again to maintain their bearings and stop from bumping into the bank. The winner of the competition is one that completes the course in the shortest time. The grand champion is rewarded with a trophy, cash prize and, if the time is an event best, entry into the Guinness Book of Records. There are also winning categories for ‘Female World Champion’, ‘Junior World Champion’, ‘Local Champion’ and best fancy dress. Since its foundation in 1985, publicity has helped the bog snorkelling championships move beyond their humble origins, and it now people from as far a field as New Zealand and the USA have caught the bog bug and made the journey to the picturesque Welsh mountains. The sport itself is also starting to catch on outside of its homeland, with Northern Ireland recently introducing its own annual event, and 2007 saw the madcap sport taken to the more forgiving climate of Australia for the first time. The Northern Ireland Bog Snorkelling Championships were founded as a fun way to raise awareness about bog lands and the unique beauty and biodiversity contained within. The event is held to coincide with International Bog Day on July 31st, an annual occasion that attempts to highlight the threatened plight of the peat bog – 96% of which have been destroyed since 1945 – and what people can do to preserve them. If bog snorkelling itself wasn’t eccentric enough, its success has prompted an even stranger offshoot – mountain bike bog snorkelling. Competitors in this event don the trusty mask and snorkel and ride a specially weighted mountain bike through a muddy pond. Most of the action takes place under water with the spectators just being able to see the top of the cyclist’s head as they move frantically, but slowly, through the ooze.